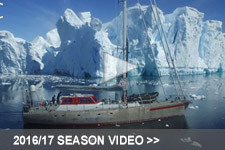 The project has returned to Port Lockroy for Stage 2, but not before a struggle. It all began in Cape Town, when six hours before Elena, Lara, Luca and I were due to get in the taxi for the airport to fly to BA, Nelson Mandela died, finally. Elena, who has worked on covering Mandela for the last seven years had to bail and stay behind organizing the ensuing media extravaganza on behalf of EBU, with heads of state arriving by the plane load. The three of us carried on of course, and I hatched a plan for Elena to join us on the Peninsula via cruise ship, departing Ushuaia today. Mandela was buried on the 15th, so she would have time to tie up loose ends, get a plane on the 18th and hopefully join us by Christmas Eve. But even this is not sure, read on . 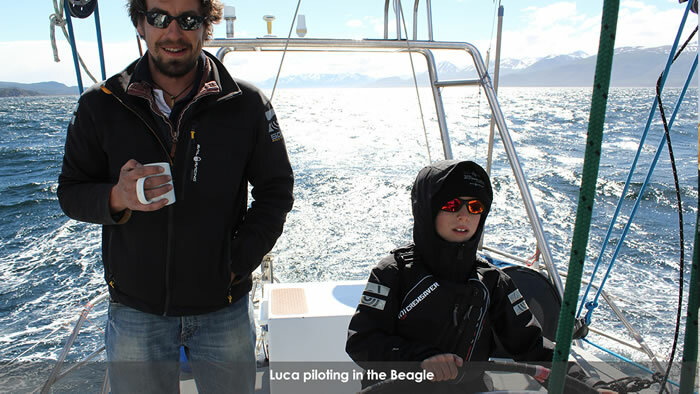 . .
After a night in Buenos Aires after our long flight, the three of us flew down to Ushuaia were Dave and Bertie were waiting for us, Pelagic having been provisioned and fuelled and more or less ready to go, after their week between their epic November trip on Stage 1. 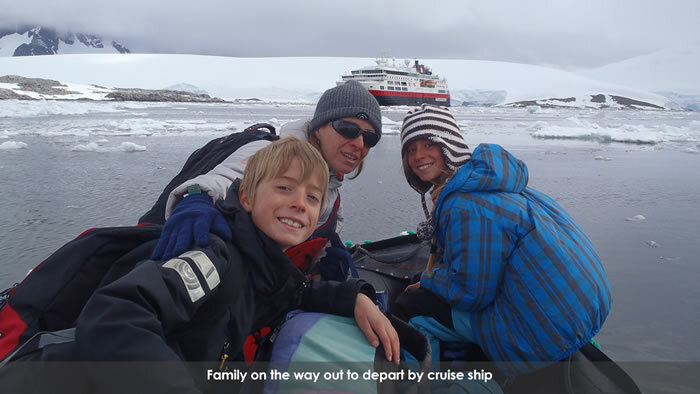 Film producer Andrew also sailed back, leaving Ruth at Port Lockroy at the base, as his family was due to arrive on the 9th. Struggles continued in Ushuaia, never a relaxing place, and we spent two days marching up and down the town doing last minute shopping; materials for Christmas decoration, art supplies; sketching pencils lost, later found; two bottles of gin and one of brandy; for flaming purposes only; elastic for making wrist loops to prevent gloves and mittens from blowing away, a fishing pole; cheap Chinese model, fell apart immediately; Lara’s favourite Argentine biscuits, plastic water bottles, sick buckets . . . . . . all between darting off to Ramos for an expensive coffee to check emails before departure – you get the picture? Bertie flew back to the UK on the 9th. 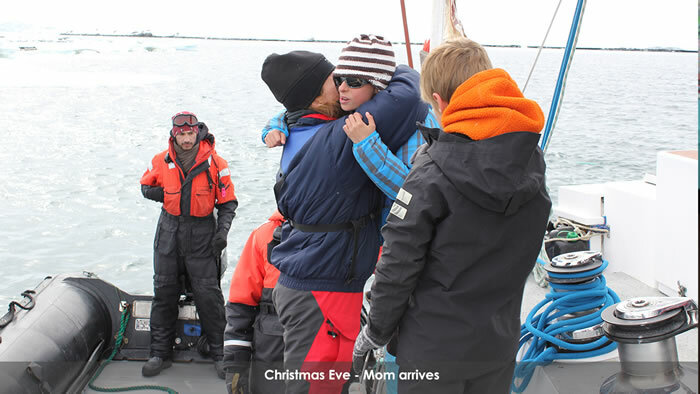 I had to second Dave back on to take Elena’s place – he was due for R and R in Stanley during the holidays and we checked options for getting him back once we hit the Peninsula, before Elena’s ship arrives. Leaving the dock in Ushuaia is always a relief – except in this case when Dave and I mis-communicated and we made a balls up of casting off and bent part of the pushpit, luckily not damaging the expensive yacht behind us – an inauspicious start. 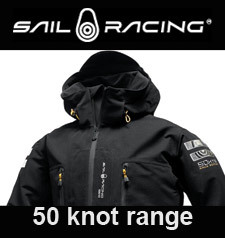 Nevertheless, we enjoyed a sail under jib down the Beagle, while Andrew, his wife Emma and Amy age 12 and Daisy age 14, all non sailors, got their gear stowed, were briefed on the plumbing in the head and all the dangers that could entail. 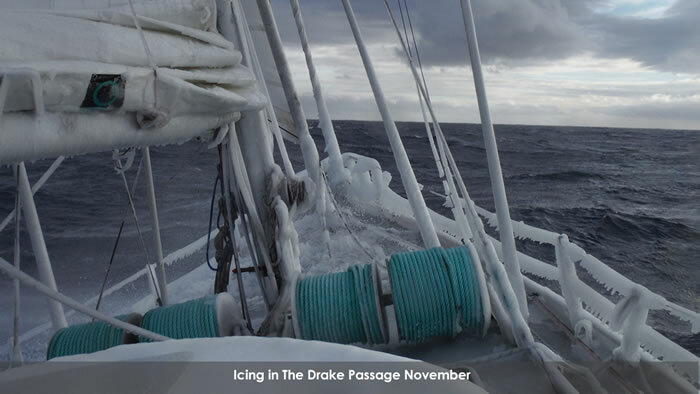 This would be a steep learning curve for them, crossing the Drake Passage on their first offshore sail. 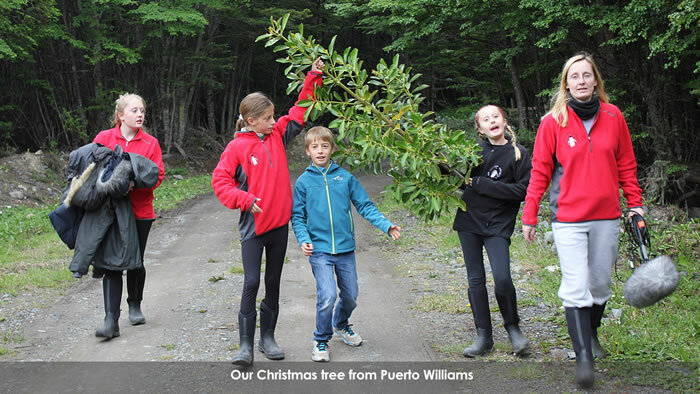 Entering the creek at Puerto Williams was really the beginning of the expedition as the town has nothing to offer in terms of retail, so no distractions. We could finally focus on getting the vessel ready for sea. The only imperative job ashore, other than waiting around the Port Captains office and customs and immigration clearing in and then clearing out, was to cut down our Christmas tree. We found a classic Tierra del Fuego version; a Canelo – winter bark - not far from the Micalvi Yacht Club which found its way into the forepeak with much speculation on whether it would survive the Drake. So too the crew. On December 11th at 1800, we left Williams with a good forecast, feasting on centolla, a king crab, on deck, a present from our friend and agent Cocha. 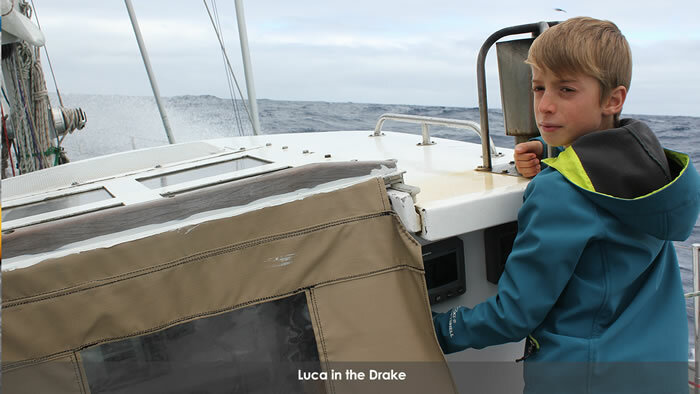 The four kids bedded down after dinner and as expected various levels of sea sickness manifested themselves as we left the protection of the archipelago near Cape Horn and picked up the Southern Ocean swell. I won’t go into detail about the crossing, but it was all about keeping the kids hydrated, passing sick buckets around and offering the usual comforting platitudes. The second day and night out was the worst, and then the weather did change and everyone slowly came to life, although mainly staying horizontal. After a windless third day, having made an exceptionally fast crossing of 72 hours from Williams, we entered Boyd Straits and turned east for Deception Island, first shelter in order to take a break, recoup and have a run on terra firma, the only sure cure for mal de mer. After a good breakfast, the first decent meal in a while for the minors, we blew up the Zodiac and ferried everyone ashore. 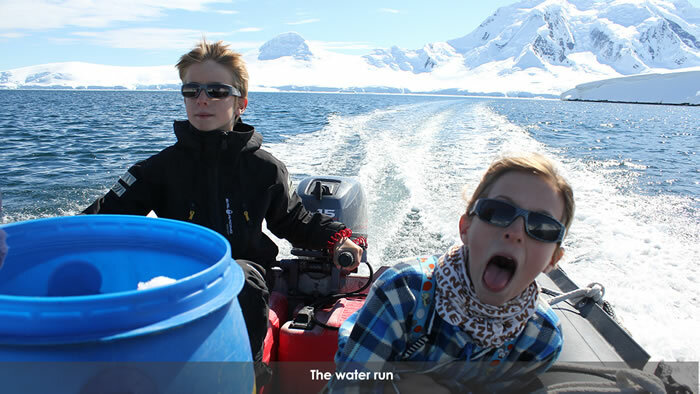 Andrew filmed the kids sledding behind the ruins of the whaling station, meeting a few stray Gentoos and standing in the warm water on the beach shrouded in steam. Everyone felt a lot better about the situation. That evening we sailed south, or rather motored in a light southerly, as the preoccupation was to get back to Lockroy asap as the first chicks would be hatching from this point forward. 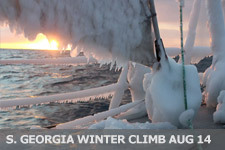 Ice reports further south from the other yachts, Pelagic Australis included, and cruise ships were not encouraging though. 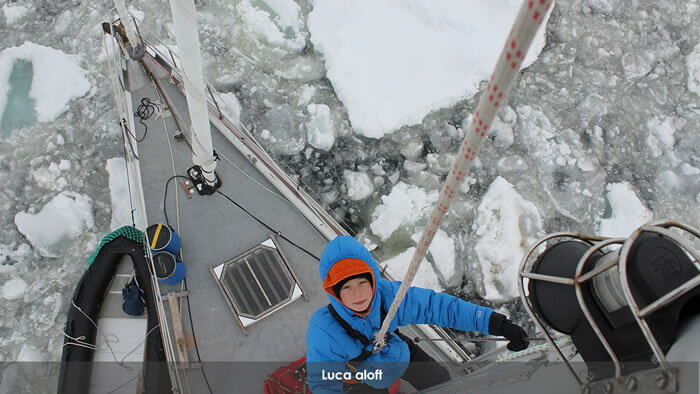 Sea ice and brash still was blocking the primary channels and anchorages in the central Gerlache Straits area, with stable weather offering no chance for a flush out soon. After a long day and night underway with little or no ice in the Bransfield Straits and northern Gerlache, we decided to spend the night at Cuverville Island. 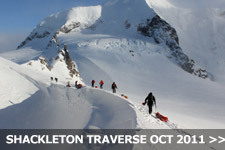 Getting to Lockroy would be a mission as apparently it was still surrounded by brash ice. In fact the base only had one landing in the last two weeks, which will be a substantial loss of income for the Heritage Trust. 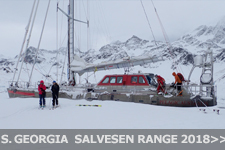 We were lucky though as the anchorage at Cuverville was open enough to spend a quite night, after three hours ashore in sunny, calm conditions at the Gentoo colony, albeit sharing the landing with a cruise ship. Next day we attempted to reach Lockroy via the Neumayer Channel from the north, enjoying twisting our way through unconsolidated brash ice – but were stopped not two miles from the station when it all closed up and got very sticky. So it was a back track to Waterboat Point dropping a hook off the Chilean base Videla. Next morning we tried via the south end of the Neumayer, and got within less than a mile from the base, and same story – thick brash and no way to push through. 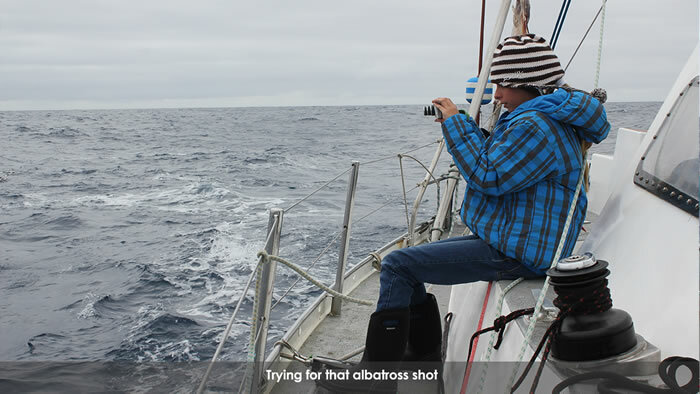 Rather than shelter at an open anchorage miles way, we decided to plant Pelagic in the brash and spend the night there, on the chance that a change of tide or wind would open it all up – and that’s what indeed happened when we woke the following morning. We pushed our way into the inside cove not 20 meters from the boathouse at Lockroy, with five lines ashore - and here we sit in glorious sunshine, having remade contact with Ruth and the team of four who man, or should I say woman, the base for the summer season. The ice has moved back in and effectively we are trapped for the moment, but able to get ashore in the Zodiac. 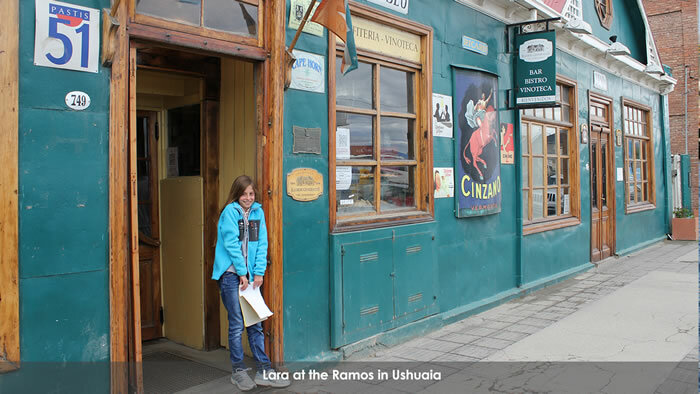 Elena has boarded the cruise ship Ushuaia this afternoon . . . . . but I am wondering . . . . . if the ice doesn’t move out and we can’t get back out nor she can get in . . . . ?? 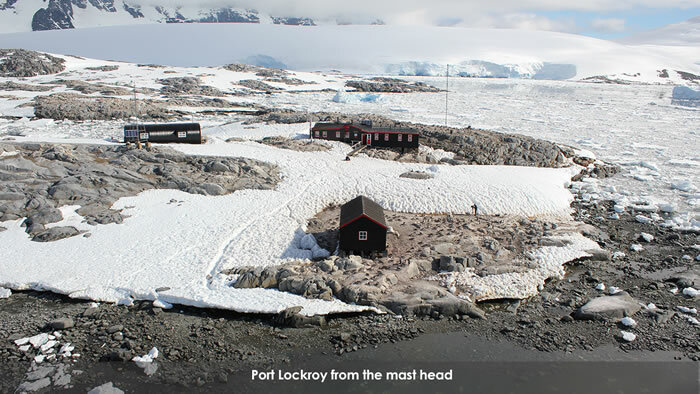 We have spent an incredible three days ‘trapped’ by ice at Port Lockroy, with a tenuous link to the shore after the sea ice closed in again with a fresh southerly on the afternoon of the 20th. 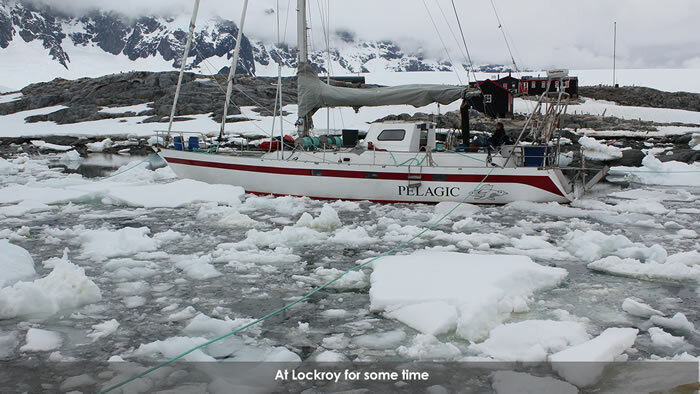 Port Lockroy is one of those places that are sometimes avoided when you want to get away from the almost daily - twice a day normally - cruise ship traffic, not to mention a default anchorage for the various yachts that are sailing in the central Gerlache area. Not so this time, as we had the rare experience of no traffic due to the brash pressing up against the base, preventing any landings by the cruise ship Zodiacs. The team at the base, Helen, Jane, Sarah and Christy were most welcoming as they hadn’t had a cruise ship landing in weeks. Normally they are flat out lecturing the tourists, conducting tours through the museum and running the souvenir shop – good quality stuff - in addition to doing ongoing maintenance to the base. We couldn’t offer showers on board, dinner and drinks, re-provisioning nor a laundry service that they enjoy as part of the cruise ship visits – only our company was mutually enjoyed and we spent the last three evenings together in the luxurious Nissan hut they are billeted in, cooking up delicious meals, playing cards and spinning yarns. While I loosely monitored the cruise ship traffic to see who could accommodate a change of plan for Elena to transfer over and for Dave to somehow get out, there was plenty to do. 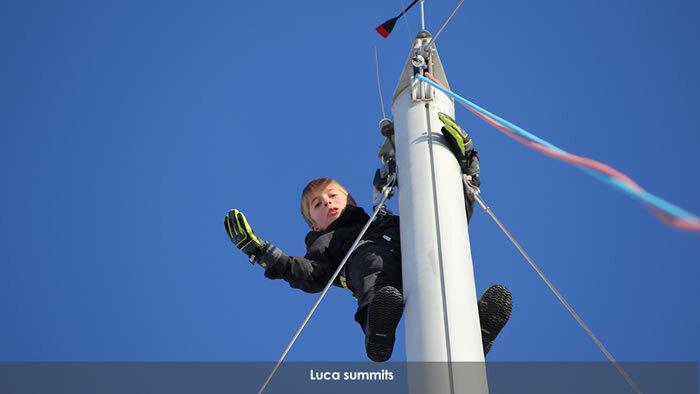 While Andrew was back filming his Gentoos and Ruth was doing set ups for the children’s film, Lara, Luca and I kayaked in the open water that came and went, hoisted everyone to the top of the mast for a view (several times in Luca’s case and he finally summited . . . ) came to grips with a penguin survey (more on that later) and decorated the Christmas tree and most of the interior of the boat – all home made – so much so that for the adults it is a veritable obstacle course to get from the chart table to the galley ducking and diving under various contraptions. All magic stuff! This afternoon I kayaked around to Jougla Point, alternatively with Lara and Luca in our two man kayak and walked across the sea ice in Alice creek to visit four crab eater seals hauled out. Nearby on the shore, the first Blue Eyed Shag chicks have hatched during the last day or two and all the Gentoos are sitting firm on their eggs. Only today has the ice retreated with a light northerly breeze, and one yacht has dared to enter, now anchored at Jougla Point. 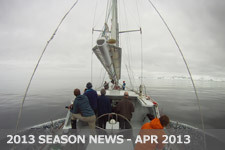 Dave is going over for a drink and to gather information on ice in the southern Neumayer, as the Ushuaia with Elena on board is due in tomorrow afternoon, in time for Christmas Eve, ice permitting. Alas, our relative solitude, will be shattered as a direct function of the retreat of the brash ice, and the ships will rush in . . . .
Well, Elena did arrive, just in time for cocktails on Christmas Eve! The cruise ship Ushuaia was the first ship into Port Lockroy just as the ice was on the way out, hopefully for the last time. Finally united, I could breathe a sigh of relief as the burden on child care can now fall on the mother . . . . as it was in the old days and should be now. Well, I have to confess to doing pretty well; their nails were cut, Lara had her second shower in two weeks, but I failed on Luca – must be a boy thing. Elena spent part of Christmas day reworking the kids clothing and equipment – a veritable chaos in the port side cabin and it was then revealed we were missing a sock here, a slipper there; some beanies had worked themselves into the bilge, etc. But as Luca frustratingly said, “We had a system before she arrived!” And we did – a boys own (Lara included). 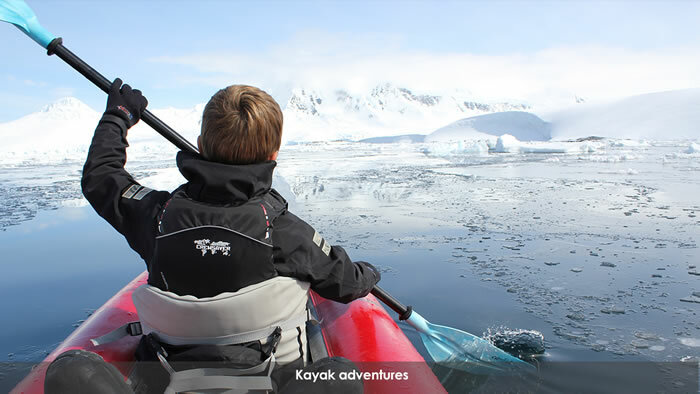 I am heartily glad she is here, as I can now concentrate even more time on kayak trips, Zodiac tours (Luca chief driver) going up the mountain for sledding and preparing to camp out – the fun bits. The cruise ships and other yachts have now started to arrive in earnest. Almost every day there is a ship visit in the morning and another in the evening. The girls at the museum and gift ship are now flat out and the relaxed days we spent with them are a thing of the past I’m afraid. Yesterday, our crew was invited on board the National Geographic Explorer, a Lindblad ship and arguably the premier polar ship of the genre. 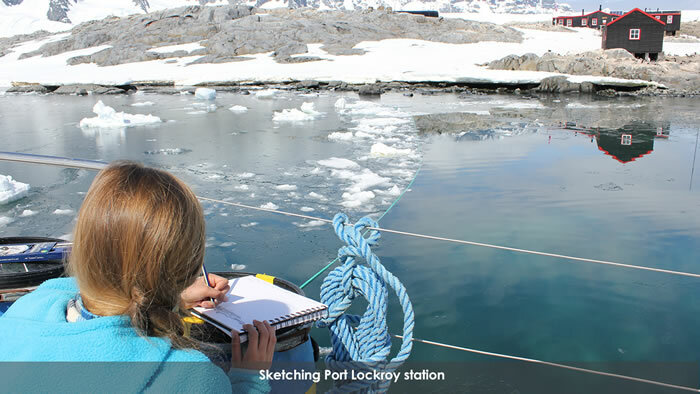 Captain Leif Skog, who has gathered an incredible amount of information that does not yet appear on the hydrographic charts, put the bow of the ship 30 meters from the rocks at Port Lockroy – most ships anchor a kilometer offshore. On the bridge, he explained his technique of dropping his anchor in deep water, putting the chain on the bottom, then overriding the chain and gently motoring against the cable tension with an bridge officer steering keeping the ship straight. He knows exactly here he can do this with 3D images of the bottom on an array of computer screens – all marked ‘not for navigation!’ He explained this is a much safer way to keep a ship on station in this environment, and also more safe for the landings as the Zodiac trips are consequently shorter. Fascinating! On the kids side, Lara, Luca, Amy and Daisy all had ice cream in the ‘café’ on board - a highlight of the tour for them! 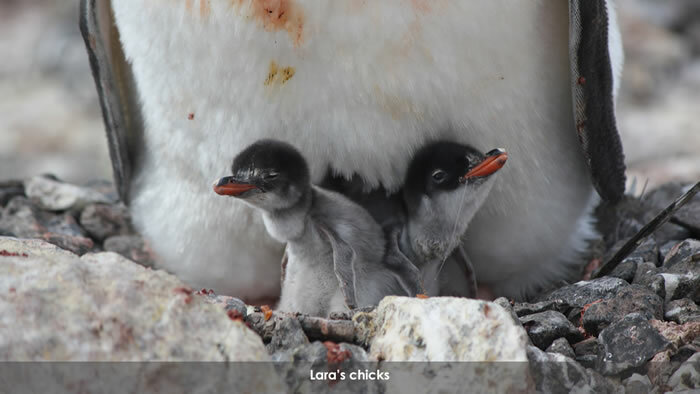 The Gentoo chicks are expected to hatch around New Year’s Day, a bit late due to the heavy snowfall on shore, which limited their nesting opportunities. Andrew, the film maker, is poised and ready to go, spending most of his time behind a camera concentrating on a few nest sites. ‘Blue Chip’ wildlife film making is all about patience, sitting there for hours, days and sometimes weeks and months on end, waiting for key moments to unfold. Very unlike the alligator, croc, snake wrestling variety of films that proliferate on the television today. 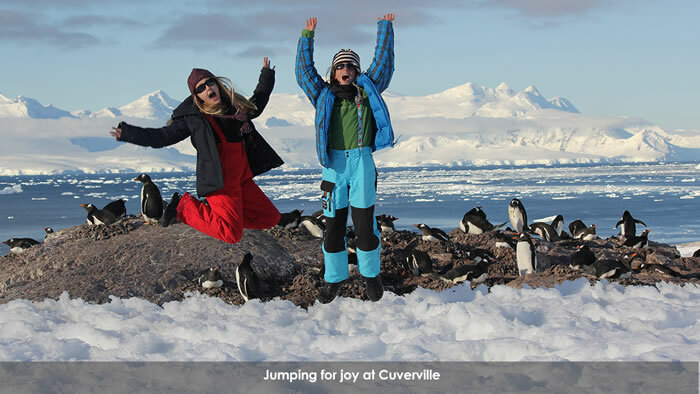 Lara’s and Luca’s penguin study is going well and takes up an hour a day monitoring two specific sites. 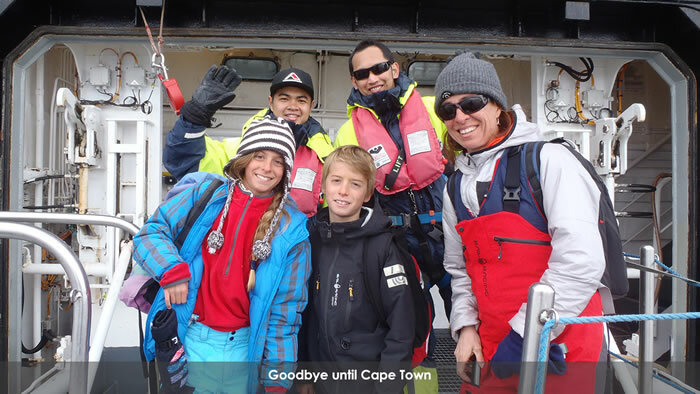 Lara has four penguins in front of the base, all named after her best friends in Cape Town – Luca has gone for volume with 17 Gentoos, some perched precariously close to a cliff edge above the sea. He has named them all and both he and Lara are keeping track of the number of eggs - Gentoos usually lay two - only visible during parent change overs, and coming up will be the number of predations by Skuas and Sheathbills and eventually the number of chicks who survive. This will be the emotional part and I hope we survive it without too many tears . . . . 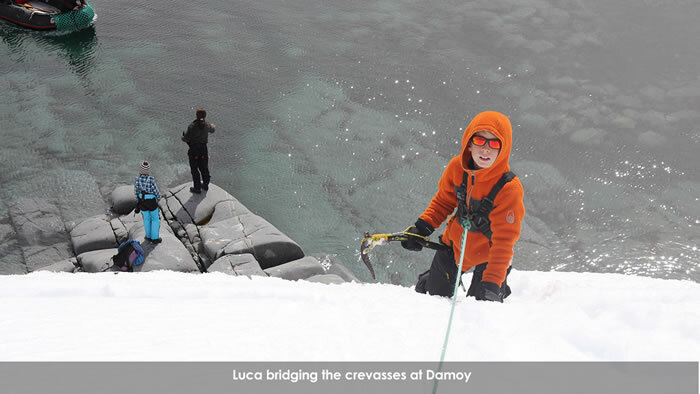 Yesterday Elena, Lara, Luca and I put on our climbing harnesses, motored around in the Zodiac to Damoy Point and climbed up a steep slope across a few bridged crevasses to gain the shoulder above the old British Antarctic Survey refuge at Dorian Cove. Lara and Luca sledded down spectacularly, I skied and Elena step plodded in deep snow - we only have one pair of skis. 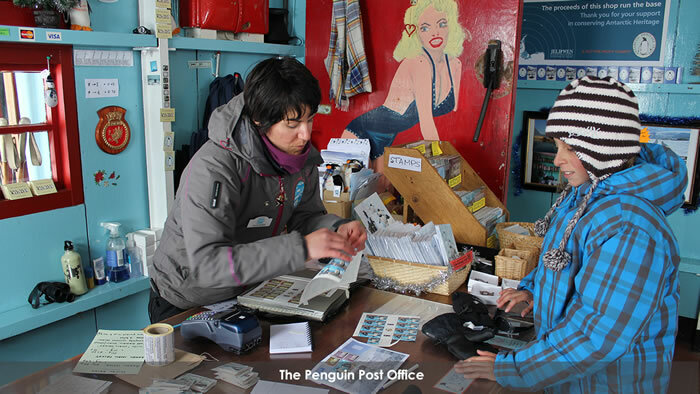 The refuge is now a historic monument, as it was a transit point for BAS personnel that were dropped by ship and later - sometimes months later due to bad weather - flown down in Twin Otters to the deep field logistic base of Rothera in Marguerite Bay. In 1988, on my first expedition with Pelagic, the base at Port Lockroy was an ugly ruin, so we spent all our time based in Dorian Cove, using the tidy refuge as a base for our filming and climbing activities. It is always very nostalgic pushing open that door with the big steel clasp catch, sitting down at the kitchen table surrounded by primus stoves, galley gear, provisions – circa 1970’s – with memorabilia on the walls . . . . .and at once there come the memories, from a far simpler time; no communications, no Antarctic permits, total flexibility, no family baggage, etc. . . . . .
It’s cloudy and windy today. Filming down below is the theme for the kid’s channel, but I am chomping on the bit to get outside and check the progress on the Blue Eyed Shag chicks at Jougla Point. 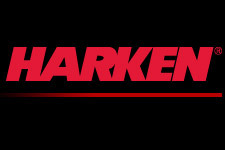 OK, this is the 4th blog from your ‘failed blogger’ in a month. Is anyone still out there checking? 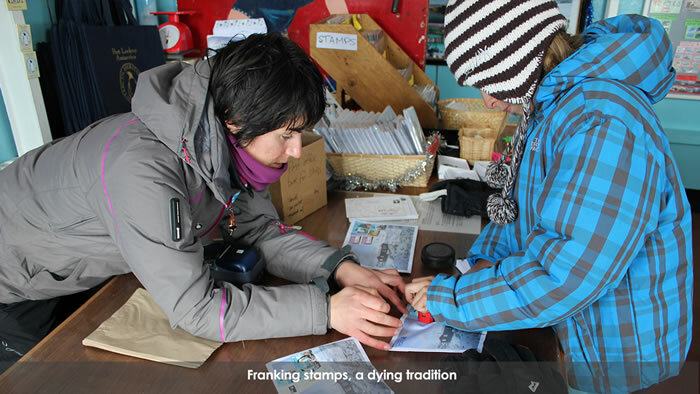 Don’t worry I will nail you again with this material in the end of voyage Newsletter, illustrated, so wait for it! Actually I have been giving this blogging lark quite a lot of thought lately – only thought and no action as you might have noticed. Sort of like when my favorite American author Henry Miller ‘thought’ about what he should be writing – but it was instead easier to cage a piece of cherry pie and coffee from a New York City diner . . . sit there and think some more. That is partly true, but for me it has been a question of exercising my selfish self, and neglecting my ‘audience’ (sorry!). I have been having too much fun to blog. I have been too exhausted every day to blog, by having too much fun. Then there is the consideration that the only time to blog is in the evening (can you imagine being below on a clear, stellar day in the Antarctic sitting at a god damned computer . . .?) and I have finally figured out that blogging after drinking a bottle of wine in the evening can only land me in embarrassing situations . . . . And then, Mark Twain said, "If you wish to inflict a heartless and malignant punishment upon a young person, pledge him to keep a journal a year." I would agree, but striking out the word ‘young’ so this could conveniently apply to yours truly. 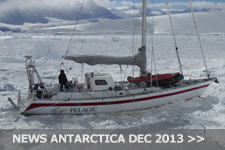 Therefore I have decided I will not be telling you in any detail about the marvelous New Years Eve party we had on the swish motor yacht Hanse Explorer that was parked in the sea ice, celebrating with my old sailing mate and Pelagic veteran Peter Isler, and also Graham “Grum” Charles, one of the Expedition Leaders on board and a two time Pelagic veteran. True to Pelagic form our crew danced until 0300 and closed the bar, but I won’t elaborate any more on that. And I won’t tell you much about our rendezvous with old friends Jerome, Dion, Alain and Claudine – pioneers of the genre – it was a private matter. I also won’t tell you too much more about Lara and Luca’s penguin survey which is still on going. 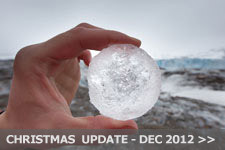 It is a major contribution to Antarctic science but it is too complicated to explain. 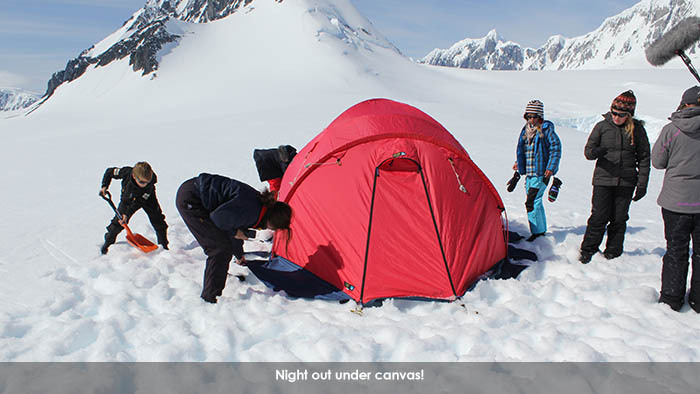 And our night under canvass on top of Damoy Point, with a view over the southern Neumayer Channel, sparkling with brash ice and the mighty massif of Mt Francais towering over us to the west on Anvers Island? Of course it is hard to imagine if you hadn’t been there. 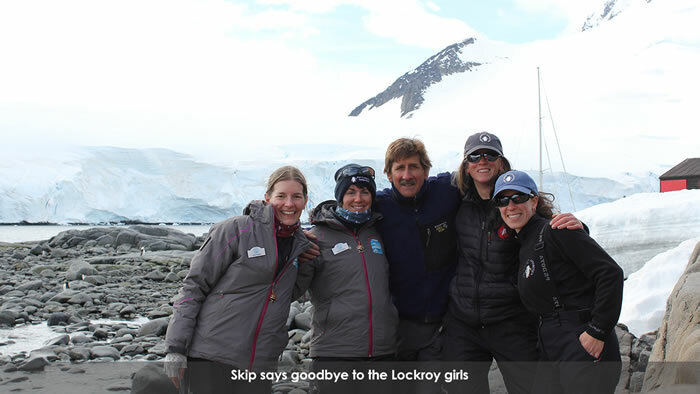 Finally on January 6th we broke through the fastness of our main commitment filming penguins at Port Lockroy, to sail south for three days in search of leopard seals, Adelie penguins and come what may. 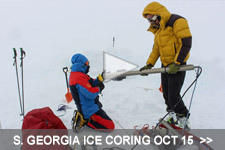 The weather was spectacularly clear and plenty of ice still to make things interesting. 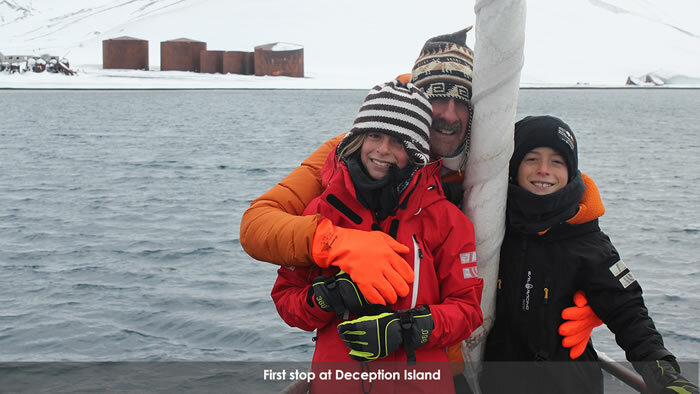 Don’t miss the Newsletter to see the photos . . . .
Andrew and Ruth are now on board, but onshore most of the day hovering over penguin nests attempting to get ‘five star’ shots. The chicks are pretty much all hatched and predation from Skuas is beginning in earnest. Me? I am left to my own desires; puttering around doing odd jobs, collecting ice for our water supply, baking bread, visiting the girls at the base and occasionally adjusting our five shore lines (I was out at midnight past in a raging gale re-attaching a wire sling to a rock, so its not all beer and skittles). Other than keeping this craft on station, there are few urgencies to deal with. Antarctic bliss. 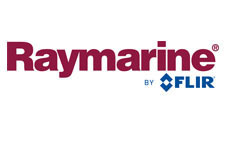 I am due out on the Fram on the 19th as Dave comes in. Bertie arrives on Pelagic Australis first week of February to carry on with Stage 3 of the Penguin Post. Check my blog . . . . I will let you know how things are going, but like always, don’t count on it! 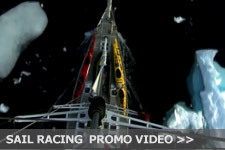 For those of you who live vicariously via blogs, come down and experience the real thing. It all went according to plan. I put a 6th shoreline out and that was about it. The Gentoos got snowed on a few times but ‘our’ chicks survived, still being monitored by Ruth and Sarah. 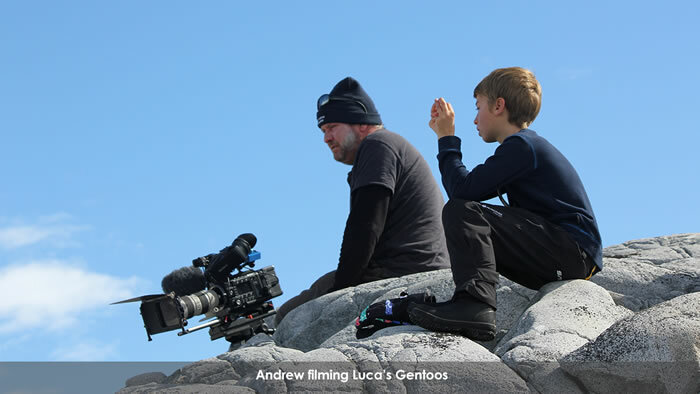 Andrew continues to film daily hoping to catch a skua predation of a chick, a Holy Grail apparently. 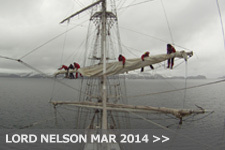 Dave arrived as scheduled on the Fram, I jumped on and arrived in Ushuaia on the 22nd and home by the 25th. Ok Bertie, over to you! Blog away!